Eight Palestinians and one Israeli soldier have been killed in heavy clashes in the northern Gaza Strip. In one of Israel's biggest raids into Gaza in recent months, troops carried out three air strikes and moved to encircle the town of Beit Hanoun. Some 60 people were wounded as troops, backed by tanks and helicopter gunships, carried out the raid. An Israeli military spokesman said the operation was aimed at stopping rocket fire into Israel. Palestinian leaders have strongly condemned it. Both the Palestinian Authority President Mahmoud Abbas and the Prime Minister, Ismail Haniya, have described the Israeli military action as a massacre. The director of the Beit Hanoun hospital told the Associated Press news agency that all the hospital's blood supplies had been used up. Witnesses said Israeli tanks backed by helicopter gunships entered Beit Hanoun overnight, amid heavy exchanges of fire. Sixty tanks were involved in the attack, AFP news agency said. It reported that Israeli soldiers took positions on rooftops during exchanges of fire with militants. Israeli bulldozers razed three houses in Beit Hanoun, and another dozen homes were hit by tank shells, the agency reported. There are reports of fighting in the nearby Jabaliya refugee camp and the town of Beit Lahiya. 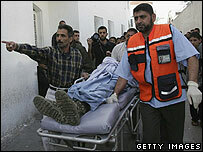 Among those killed are a Palestinian policeman and militants. 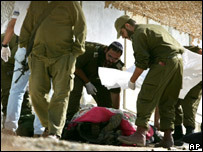 On Tuesday, Israeli forces killed two Hamas militants in the Gaza Strip in a clash in the south near Khan Younis. Israeli forces have made regular incursions into Gaza since late June, following the capture of an Israeli soldier in a cross-border raid by Palestinian militants. Reports say an inner cabinet of top ministers which met to review the situation in Gaza has decided not to expand the military offensive. Israel's Defence Minister, Amir Peretz, said the country had no intention of reoccupying the Gaza Strip. "On no account ... do we have any intention of returning to Gaza, of remaining there, or of sinking in its quagmire," he said. A spokesman for the Hamas government, Ghazi Hamad, said Israel intended to maintain Gaza's state of crisis to give itself "a green light in order to continue aggression against our people". Wednesday's attack comes amid some sign of movement to end the deadlock over Israeli soldier Cpl Gilad Shalit, who was captured on 25 June by Palestinian militants. A Hamas delegation is in Cairo for talks with Egyptian officials on a possible prisoner exchange in return for his release. Egypt has been acting as a mediator since Cpl Shalit's capture. Since his capture, more than 300 Palestinians have been killed in Israeli army operations in Gaza and the West Bank, according to Israeli human rights group B'Tselem.